The four recently confirmed Illinois counties were added to the white-nose syndrome map along with seven suspect Missouri counties in a big update on Thursday March 12th, 2015. Reported first on March 3rd, five bats submitted from Union, Saline, Johnson, and Jackson counties in Illinois were confirmed with the disease. Meanwhile six Missouri counties get the suspect tag after bat swabs or visible fungal growth were found in caves in Hickory, Stone, Texas, St. Louis, Oregon, and Phelps counties. A seventh suspect Missouri county, Cole County, was added as a 2014 suspect jurisdiction due to visible fungal growth that was noted. With all the recent confirmations, there is an understandable lag and the recent confirmations in Arkansas have yet to be included. Produced by Lindsey Heffernan of the Pennsylvania Game Commission, the map shows the confirmed and suspected occurrences of WNS by county/district from its initial discovery in 2006 through March 12th, 2015. 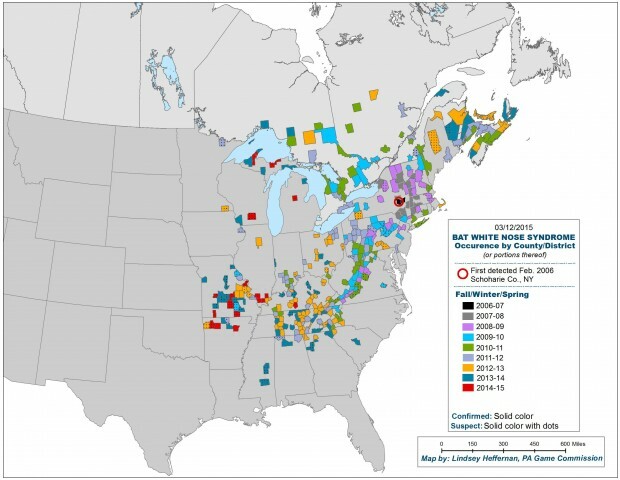 To date, WNS has been confirmed in bats in 25 states and five Canadian provinces.